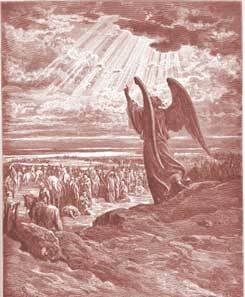 The angel of the Lord rebukes the people. (1-5) The wickedness of the new generation after Joshua. (6-23)1-5 It was the great Angel of the covenant, the Word, the Son of God, who spake with Divine authority as Jehovah, and now called them to account for their disobedience. God sets forth what he had done for Israel, and what he had promised. Those who throw off communion with God, and have fellowship with the unfruitful works of darkness, know not what they do now, and will have nothing to say for themselves in the day of account shortly. They must expect to suffer for this their folly. Those deceive themselves who expect advantages from friendship with God's enemies. God often makes men's sin their punishment; and thorns and snares are in the way of the froward, who will walk contrary to God. The people wept, crying out against their own folly and ingratitude. They trembled at the word, and not without cause. It is a wonder sinners can ever read the Bible with dry eyes. Had they kept close to God and their duty, no voice but that of singing had been heard in their congregation; but by their sin and folly they made other work for themselves, and nothing is to be heard but the voice of weeping. The worship of God, in its own nature, is joy, praise, and thanksgiving; our sins alone render weeping needful. It is pleasing to see men weep for their sins; but our tears, prayers, and even amendment, cannot atone for sin. 6-23 We have a general idea of the course of things in Israel, during the time of the Judges. The nation made themselves as mean and miserable by forsaking God, as they would have been great and happy if they had continued faithful to him. Their punishment answered to the evil they had done. They served the gods of the nations round about them, even the meanest, and God made them serve the princes of the nations round about them, even the meanest. Those who have found God true to his promises, may be sure that he will be as true to his threatenings. He might in justice have abandoned them, but he could not for pity do it. The Lord was with the judges when he raised them up, and so they became saviours. In the days of the greatest distress of the church, there shall be some whom God will find or make fit to help it. The Israelites were not thoroughly reformed; so mad were they upon their idols, and so obstinately bent to backslide. Thus those who have forsaken the good ways of God, which they have once known and professed, commonly grow most daring and desperate in sin, and have their hearts hardened. Their punishment was, that the Canaanites were spared, and so they were beaten with their own rod. Men cherish and indulge their corrupt appetites and passions; therefore God justly leaves them to themselves, under the power of their sins, which will be their ruin. God has told us how deceitful and desperately wicked our hearts are, but we are not willing to believe it, until by making bold with temptation we find it true by sad experience. We need to examine how matters stand with ourselves, and to pray without ceasing, that we may be rooted and grounded in love, and that Christ may dwell in our hearts by faith. Let us declare war against every sin, and follow after holiness all our days. "And it came to pass, when the angel of the LORD spake these words unto all the children of Israel, that the people lifted up their voice, and wept." The people then brought forth fruits of their repentance, and served the LORD; even though they now had to bear with the punishment of God not anymore driving the enemies out, as He did at the first. But the generation following was wicked and proud! "Nevertheless the LORD raised up judges..yet they would not hearken unto their judges, but they went a whoring after other gods.." Christians, do you not remember how hard it was because of your sins, for you to finally be humbled and broken enough, to come to repentance and a sincere and thorough conversion? The ungodly despise and reject Jesus so they can keep sinning and live however they wish. The Israelites did not listen to God and so in verse 3 they had to suffer the consequences of their actions. Anyone who disobeys God will eventually have to face the bad consequences of their actions. Dear friends in the LORD a lot can be driven out this portion of scripture however my emphasis is verse 21, GOD let a few tribes during the time of Joshua his servant not as a sign of defeat to him but for the young ISRAELITES to drive out as a task if they really understood their God but instead this guys just copied the evil their subjects were doing this caused them get a curse for a blessing lets check our lives what is that which was left in your life may be family which must be removed? or else you may miss your blessing. What Do You Think of Judges 2?